I’ve always admired the idea of the Hot Buttered Rum; alcohol + butter must surely equal some form of elation. And yet each and every time I’ve had a sip, once past the butter, I’ve found myself intensely disappointed, usually by lack of character and substance. The body is generally too light and the flavors too shallow. The Hot Buttered Rum needed a secret ingredient. Lately it seems that an allspice liqueur has been popping up in several foodie magazines that I read. St. Elizabeth Allspice Dram is a “tradition of the West Indies,” which I take to mean that it is made with a Jamaican spice, using Jamaican rum, because the product itself is produced in Austria. On its own, the liqueur tastes strongly of clove and has a peppery undertaste, with a somewhat syrupy body. I decided to give the classic Hot Buttered Rum a little tweaking by adding the allspice liqueur, substituting tea instead of water, and using a lightly sweetened compound butter to finish it off. 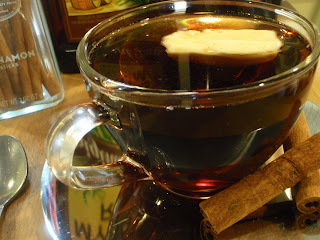 *I had excellent results with Twinings Cinnamon Apple Breakfast Black Tea. It’s mild and tastes slightly of mulled apple cider. *Let four tablespoons of salted butter soften at room temperature. Add 2 tsp of brown sugar and a ¼ tsp of ground cinnamon and mix well. Reshape if desired and store in fridge or freezer until needed. Thanks so much for the recipe. Such a perfect libation for a winter night.